I must confess than when I read that Synaesthesia had changed their name to Kyros after one just album, I rolled my eyes... When I subsequently read that Kyros "debut" release, Vox Humana, would be a 2CD double album, I rolled my eyes again... What were these guys smoking? None of this seemed to be sensible or pragmatic for such a young band. Well screw sensible or pragmatic, what do I know?! Vox Humana is a masterpiece of modern progressive music, standing shoulder to shoulder with some of the recent top releases from established and veteran artists, indeed in many cases surpassing them. First off Kyros sound so much better Synaesthesia. I liked the Synaesthesia album, it was pretty good, but Vox Humana has grabbed me in a way that I haven't musically experienced in many years. The sound is deep and beautifully rounded, the production first class. It has a modernity exemplified by its use of EDM/Dubstep influences, but retains core progressive elements and a degree of commerciality as required. I stick this album on repeat and don't get bored with it. 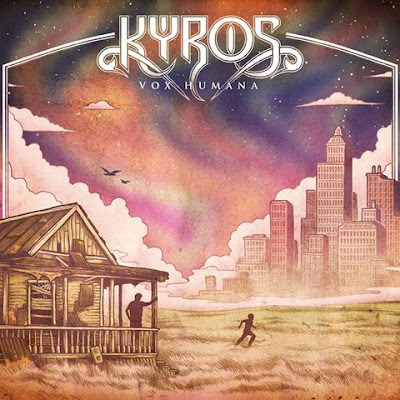 The nearest musical comparison I could find for Kyros, would probably be Frost*, with a dollop of Muse and an occassional dash of Marillion added for good measure, but even that doesn't really describe just how good this band and this album is. Overall I think I can sum Vox Humana up in four words. Album of the Year.